application form to DRYSRHU before the closing date of 17-12-2018 along with application form and DD of Rs.1250 for Gen/OBC and Rs.750/- for SC/ST candidates. Selection will be based on NET score and Career Assessment for this DRYSRHU Recruitment 2018. 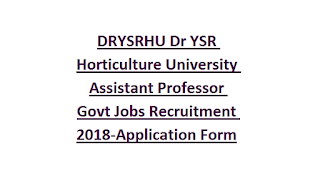 Detailed information about these DRYSRHU Assistant Professor vacancies are given below. There are total 101 vacancies are in this Assistant Professor recruitment 2018. Post Graduate Degree with NET qualification is required for this DRYSRHU recruitment 2018. There is no upper age limit for this Asst Professor recruitment 2018. Salary is applicable as per the norms of University or UGC. DD to be taken in favour of THE COMPTROLLER, Dr.YSR HORTICULTURAL UNIVERSITY, VENKATARAMANNAGUDEM payable at TADEPALLIGUDEM, WEST GODAVARI DISTRICT, ANDHRA PRADESH. Candidates can download application form from the official website of www.drysrhu.edu.in. 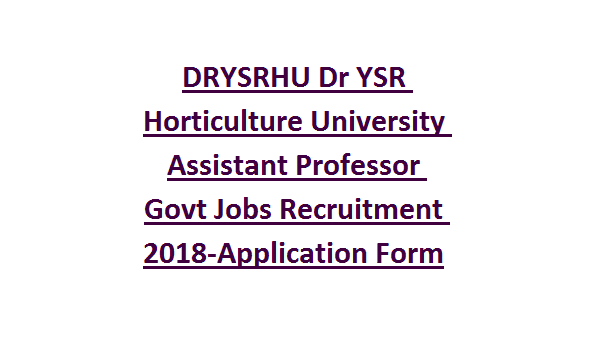 Last date to submission of application form to Dr YSR Horticulture University Jobs is 17-12-2018.